I am definitely on a soup kick lately. This usually happens about now as I grow tired of salads and warm weather food and want to “cozy up” with something warmer. Soup always does that for me and this soup, Indonesian Chicken and Peanut Soup, has it all — noodles, curry, peanut sauce, and just the right amount of heat. Yummy does not even begin to cover it. This soup is downright sumptuous. The recipe comes from Fine Cooking, and thanks to rotisserie chicken and quick-cooking rice noodles, you can be curling up with this bowl of comfort in no time. Bring a large pot of well-salted water to a boil. Cook the noodles according to package directions. Meanwhile, heat the oil in a medium Dutch oven or other heavy-duty pot over medium-high heat. Add the shallots and cook, stirring occasionally, until just starting to brown, 3 minutes. Add the curry powder and cook until fragrant, stirring constantly, about 10 seconds. Add the broth, coconut milk, peanut butter, soy sauce, and sugar, and whisk until the peanut butter is fully incorporated. Add the chicken and bring to a simmer. Cover and simmer gently for 15 minutes. Add the lime juice, and season to taste with more soy sauce and pepper. I’ve made no attempt to hide my deep and abiding love affair with peanut sauces. It’s something I simply cannot pass up either in a restaurant or while flipping through recipes. I’m also a huge fan of The Pioneer Woman. So needless to say when the forces of the universe collide to bring me a peanut sauce recipe by The Pioneer Woman (who, by the way gets bonus points for including pasta!) you know I’m going to be one happy cook! Grilled Peanut Chicken and Broccolini from The Pioneer Woman did not disappoint. The broccolini provided some nice crunch and bitterness to the slightly sweet and spicy sauce which is used to marinate the chicken and coat the pasta. This isn’t fancy, I’m pretty sure positive it’s not authentic (barbecue sauce in peanut sauce??) but it is definitely delicious and different and incredibly worthy of being a Weekly Winner. And it made this cook very, very happy! Make the marinade/sauce by whisking together olive oil, peanut butter, soy sauce, barbecue sauce, honey, Worcestershire, lemon juice, garlic, and cayenne. Taste and add more honey, soy, or lemon juice depending on your taste. Pour off 1/2 cup of the sauce and save in the fridge for later. Place the chicken in the bowl, cover with the sauce, and refrigerate for 2 hours to marinate. When you’re ready to cook, toss the broccolini with a little olive oil and sprinkle with salt and pepper. Heat a large grill pan (or an outdoor grill) over medium heat. Drizzle with olive oil, then place the chicken, broccolini, and onion slices on the surface. Cook until the chicken is done, about 5-7 minutes per side, being careful to turn the broccolini to keep it from burning. (If the chicken is thick, you’ll want to get it started before you add the broccolini to the grill.) You want the broccolini to get nice and brown/grilled but not char. Cook onions until they’re brown and softened. Before serving, heat the reserved sauce in a small skillet until bubbly. Remove from the heat and toss with the noodles. 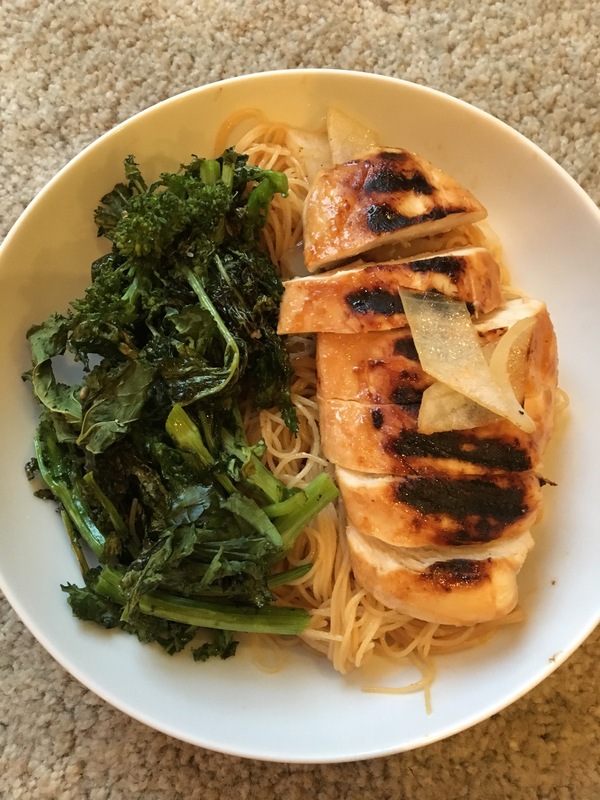 To serve, pile noodles on a plate with a chicken breast, some of the broccolini, and a grilled onion slice. Serve with extra soy sauce. It’s summer. It’s hot. I don’t want anything heavy and some nights, I don’t even want anything hot to eat. Cool, healthy, light and easy…that’s what I’m talking about. However I have to admit that salads do seem to get a bit old. They work fine for a summer lunch but come dinner I just want something more than another salad. 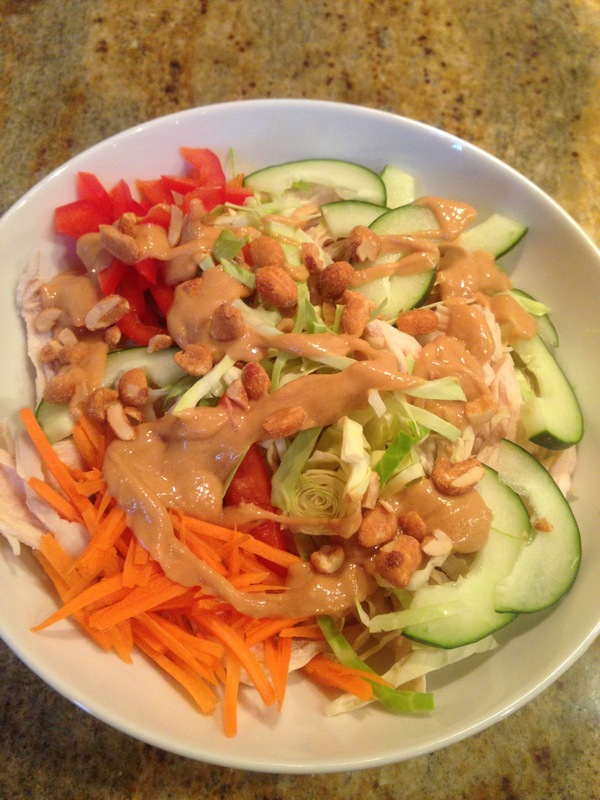 Enter: Chicken Noodle Bowl with Peanut-Ginger Sauce from Southern Living Magazine. Ding-ding-ding!!! We have a winner! This hits the spot on so many levels for me. First and most importantly they had me at peanut sauce. Honestly, I can spread a good peanut sauce on cardboard and be happy. Then comes noodles — I’ve yet to meet a noodle I didn’t like. Last but not least, my good old friend and dependable standby, the chicken. Honestly, there is not a thing to dislike about this dish. It’s incredibly quick, easy to make and very satisfying to dive into. Also, there is no need to turn on a stove or oven as the noodles are cooked with the microwave. Yay! This takes the new “bowl” craze and tweaks it just enough to ensure that it will be in very steady rotation in my household. Another great thing about this type of dish is that it is infinitely changeable and customizable to whatever you have in the fridge. You can substitute any kind of noodle or pasta and mix and match whatever veggies you have on hand. The only thing I won’t be messing with is the peanut-ginger sauce. It is and will remain perfect, regardless of what it is drizzled on. 1. Prepare the Sauce: Process all 9 ingredients in a blender or food processor until smooth. 2. Prepare the Chicken Noodle Bowl: Microwave water in a large bowl on HIGH 10 minutes. Stir vinegar and salt into boiling water. Add noodles and let stand until softened, about 5 minutes. Drain noodles. 3. Divide noodles, chicken, cabbage, cucumber, carrots, and bell pepper among 6 bowls. Top each bowl with 1 tablespoon peanuts and 2 tablespoons Peanut-Ginger Sauce. Serve remaining sauce on the side. I have made absolutely no secret of the fact that I dearly love anything with a good peanut sauce. I’m also a complete sucker for noodles of any variety or nationality. If there’s a noodle dish on the menu, I’ll probably order it. And if that noodle dish happens to include a peanut sauce. Ding-Ding-Ding! We have a winner. Beef Satay Noodles is a super easy, totally delicious recipe that can be whipped up anytime. I tried it out at home first a little over a week ago and then made it for a client and both responses were the same — “keep this in short rotation”. The thing that makes it so quick and simple is the use of pre-packaged broccoli slaw. It can be adapted to various heat tolerances by adding more or not so much Sriracha and, if you’re like me, you can completely omit the cilantro. I didn’t miss it and I doubt you will either. The recipe comes from Food Network Magazine. Find it or copy it here because trust me: you need this recipe. Put the noodles in a bowl; cover with warm water and soak at least 20 minutes. Meanwhile, whisk the peanut butter, soy sauce, ginger, 1/2 teaspoon salt and a few grinds of pepper in a large bowl. Add the beef and mix with a spoon to combine. Heat 1 tablespoon peanut oil in a large skillet over high heat. Add the shallots and cook, stirring, until softened, about 4 minutes. Add the broccoli slaw and cook, stirring, until it starts wilting, about 3 minutes. Transfer the vegetables to a medium bowl. Heat the remaining 1 tablespoon peanut oil in the skillet, then add the beef mixture. Cook, stirring occasionally, until browned, about 7 minutes. Meanwhile, gently stir the noodles to separate. Reserve 1/2 cup soaking water, then drain the noodles. Return the vegetables to the skillet with the beef and stir to combine. Add the noodles, the reserved soaking water and the Sriracha. Cook, gently tossing, until warmed through, about 4 minutes. Serve with lime wedges and more Sriracha. Here I go again – declaring my ardent and undying love for a good peanut sauce. Heck, in most cases I’ll settle for an average peanut sauce! It’s one of those things that I simply cannot ignore –If I see a recipe for it, I’ll tear it out. If I see it on a menu, chances are good I’ll order it – regardless of what it is on or comes with. 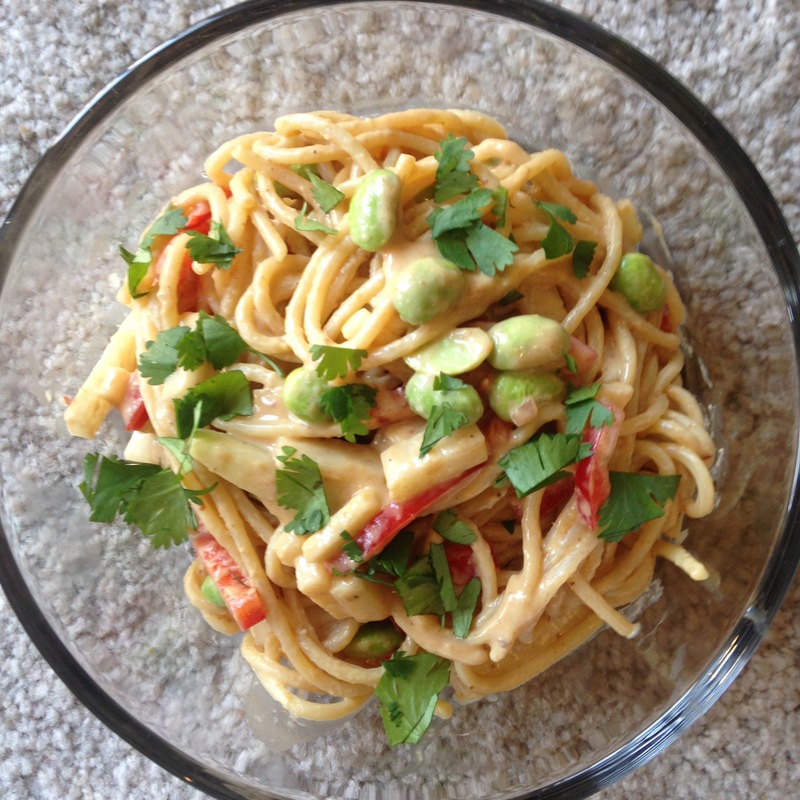 But, you combine a good peanut sauce with pasta and a pork product of any variety and I am in…. all in! I have featured a bunch of variations on this peanut theme here — Dan Dan Noodles, Peanut Soba with Stir-Fried Beef & Broccoli, Grilled Asian Chicken with Peanut Noodles, Hoisin Peanut Sauce, Thai Peanut Curry Noodles with Edamame and Kohlrabi. This week’s however, just might be the best. At least its my new current favorite. 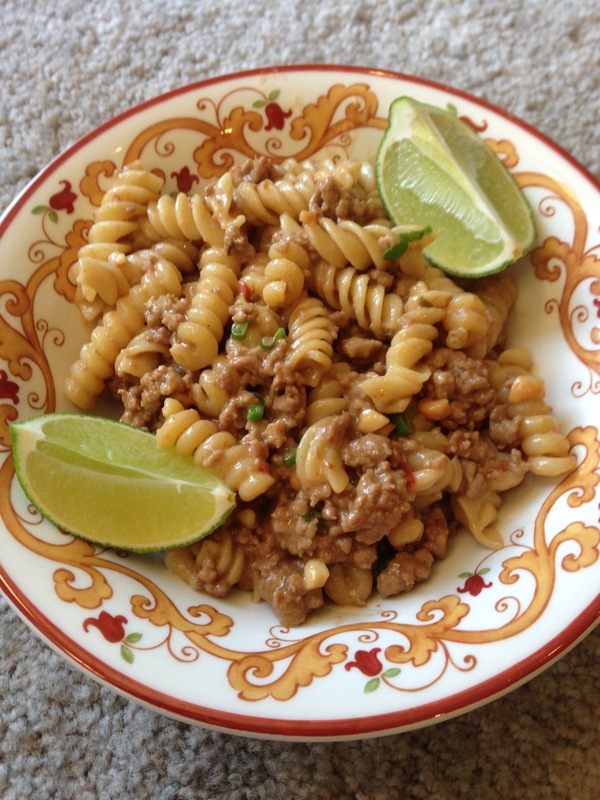 Its Rotini with Ground Pork and Spicy Peanut Sauce. 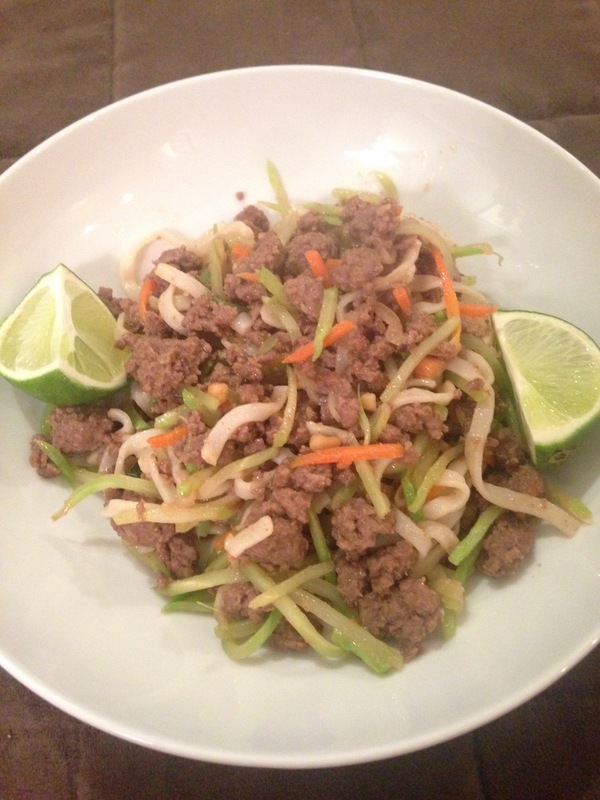 It packs a punch heat wise, but the lime is a nice counterbalance to the heat and well, then you have pork and pasta! A word of warning; however … this is one of those dishes that you just keep eating, and eating, and eating. The recipe comes from Fine Cooking and as usual, the only change I made was deleting the cilantro. Including that would disqualify it immediately from the title of perfection. Besides, the recipe clearly stated that the cilantro was optional! Bring a large pot of salted water to a boil. Add the rotini and cook according to package directions until al dente. Meanwhile, heat a 12-inch heavy-duty skillet over medium heat. Add the oil, then the scallion whites. Cook, stirring, until softened, about 1 minute. Add the ginger and garlic and cook, stirring for 30 seconds. Crumble in the pork and cook, stirring occasionally, until it loses its pink color, about 5 minutes. Stir in the soy sauce, vinegar, sambal oelek, and sugar and cook until bubbling. Add the peanut butter and stir until incorporated. Pour in the broth, stir well, and bring to a simmer. Cook for 2 minutes, stirring occasionally. Reserve 1/2 cup of the pasta water, drain the pasta, and return it to the pot. Stir in the pork mixture and scallion greens. Thin the sauce with the pasta water, if necessary. Divide among plates or bowls, squeeze a lime wedge over each serving, and top with cilantro, if using. I think I’ve mentioned before that I’m a sucker for a good peanut sauce. I love it on anything, but particularly on noodles. And these are cold noodles which made them the perfect side dish to grilled pork chops – no added heat in the kitchen! I’ve only recently discovered kohlrabi and I’m definitely hooked! I’m not even sure if there are any recipes that call for it cooked as I’ve only tried it raw and love it. Crunchy and clean tasting – like broccoli’s sweeter sister. Add to that the creaminess of the edamame and the crispness of the red pepper which all just mixes beautifully with the heat of the green curry paste and luscious-ness of the peanut butter. Have I waxed poetically enough about this dish??? Probably. The only thing I’ve changed in this recipe is that it called for whole wheat spaghetti. Yeah, that’s not going to happen…. not in this kitchen. The recipe comes from Eating Well Magazine and if you make this, you will definitely be eating well. Very Well. Bring a large saucepan of water to a boil. Add spaghetti and cook according to package directions. Reserve 1/4 cup of the water, then drain the pasta and rinse well with cold water. Whisk the reserved pasta water, peanut butter, shallot, curry paste, ginger, soy sauce, oil and salt in a large bowl. Add the pasta, edamame, bell pepper and kohlrabi; toss well to coat.